It's been a while since I've been able to work an awful pun into the title of this post, but how can you not go with some variation of the above? The film title was basically begging for this type of treatment. Anyway, my brilliant puns aside, let's take a look at some of the numbers. As the header suggests, it was "Texas Chainsaw 3D" that surprised most of us and took the top spot this week. While it was, officially, the only new wide release this weekend, competition from holdovers like "The Hobbit: An Unexpected Journey", "Django Unchained", and "Les Miserables" was expected to be fierce. But alas, though it will probably only be the case for a couple of weeks, as of now, we can say that "Texas Chainsaw 3D", so far, is the highest-grossing film of 2013. I know it doesn't mean a single thing since this was the first weekend of the year, but just saying that feels wrong in so many ways. "Promised Land" and "The Impossible" both got nationwide expansions this week, though neither managed managed to resonate very strongly with audiences. Hit the jump to see how everything sorted out! 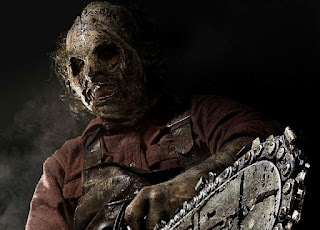 "Texas Chainsaw 3D" took the top podium this weekend, earning a surprising $23MM. 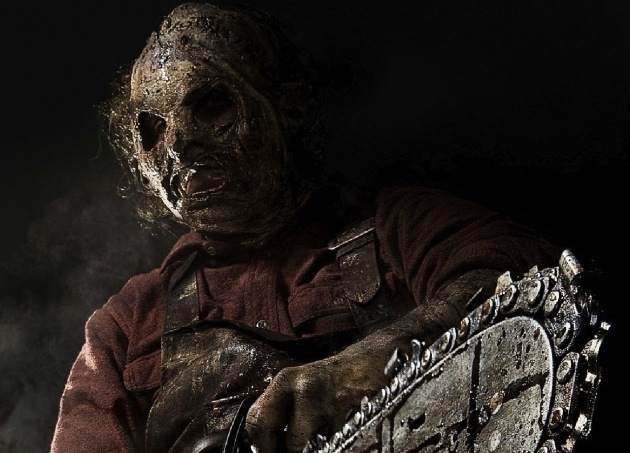 The film, which has reviewed pretty poorly - though not much outside of what other Texas Chainsaw movies have done in the past, sans the original - was expected to land somewhere in the $15MM range. But apparently the younger audiences showed up for this one and gave it some extra juice. There are no official reports on an estimated budget, but a couple of different sources put it somewhere in the $10MM range, which means it's already doubled its investment. With $23MM, the film opened right in the middle of where the previous two Texas Chainsaw movies debuted. 2003's "The Texas Chainsaw Massacre" opened with $28MM, making it the best opening from the franchise. 2006 saw a decline, when "The Texas Chainsaw Massacre: The Beginning" opened with $18MM. While all three films hovered around the same budget, the 2003 film went on to gross just over $100MM worldwide, while the 2006 film only surpassed $50MM. As reviews were also all in the same general area with all three films, I expect the trends of this film to now continue where they started. My guess is this one ends up somewhere in the $75MM range with its worldwide gross. Finally moving on, in second this week was Quentin Tarantino's "Django Unchained". The film made $20MM, bringing its domestic total up to just over $106MM. No international tallies are in for the film, but with this weekend's gross, it does surpass its budget of $100MM. The film now sits only $1MM behind "Pulp Fiction" and $14MM behind "Inglourious Basterds" for being Tarantino's highest-grossing film. There's no doubt, Django will surpass Basterds within the next full week and become Tarantino's most successful film by the weekend. At 88% on Rotten Tomatoes, "Django Unchained" currently holds the exact same rating that "Inglourious Basterds" received. The film has played incredibly well to both critics and audiences, and should continue with strong numbers for at least the next couple of weeks. In third this week, it was "The Hobbit: An Unexpected Journey" with $17.5MM, bringing its domestic totals up to $263MM. It's also been on a war path internationally, and has now racked up more than $560MM overseas. It currently sits at $824MM, and, assuming its international production can keep up, has a real shot at eclipsing the $1BB mark. It still sits on the bottom rung of the entire Lord of the Rings/The Hobbit franchise, but it's gaining ground. Regardless, the film has made its money. Jumping next to the fourth-place spot, it was "Les Miserables" with $16.1MM, which was actually a few million less than I expected. The film has received fantastic reviews from critics, but I don't think the word-of-mouths from general moviegoers has been nearly as positive as we first expected. While I still haven't yet seen the film myself, people I trust tell me that it's too long and ends up being a bit of a chore to get through. That being said, the film has already made $103MM domestically - becoming the fastest live-action musical to ever reach that mark (13 days) - and added $67MM internationally. And with a $61MM budget, the $170MM it's made worldwide puts it well into the black. As note, "Les Miserables" is now the seventh-highest grossing Live-Action Musical of all-time, not taking inflation into account. Rounding out the top five, it was another surprise, "Parental Guidance", with $10.1MM. 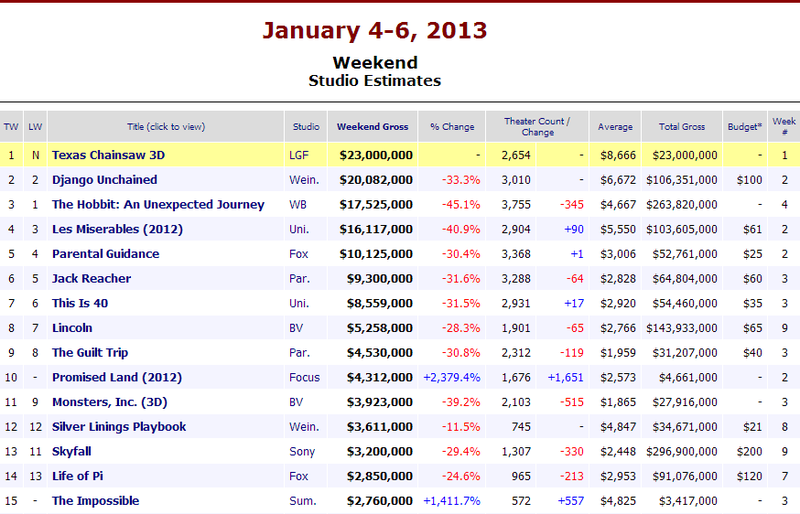 With only a 30.4% drop from last weekend, the film showed the second-lowest drop of any film in the top ten this week, with only Steven Spielberg's "Lincoln" proving more stable. With $10MM this weekend, the film has now made $52MM domestically, more than doubling its budget of $25MM. And while I wouldn't have expected one at all, it has had a presence internationally, racking up another $15MM overseas. Being a pure family-friendly comedy, this was expected to hang around for a few weeks. Don't ever expect anything of major note from this film, but it's already done well for the studio. Outside of those films, "Jack Reacher" surpassed its $60MM budget with it its $9MM this weekend; "Lincoln" is about a week away from breaking the $150MM mark, likewise with "Skyfall" and the $300MM mark, and "Life of Pi" with the $100MM mark - though it should be noted that "Life of Pi" continues to dominate on an international level, and did surpass the $300MM mark in that department with its gains this weekend.